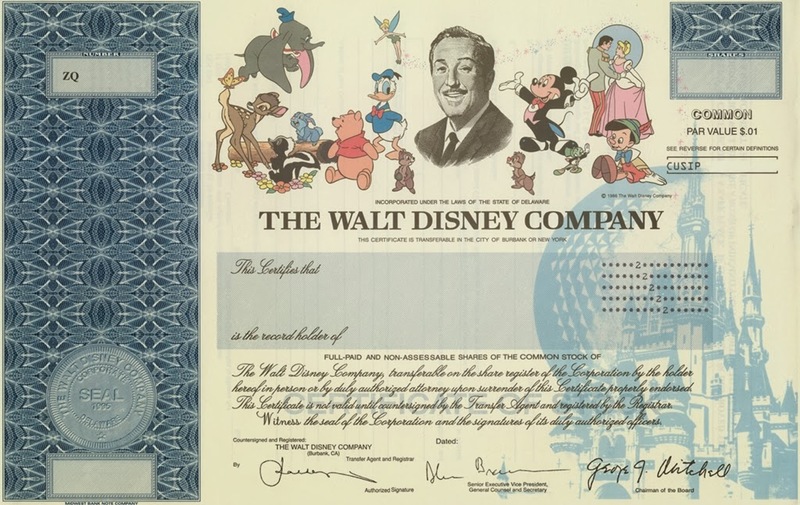 Disney has some sad news for their fans yesterday as they announced that they were doing away with issuing their physical stock certificates. I purchased one for my daughter when she was born many years ago. It requires you to purchase a minimum of one share of stock of the company usually through a company that helps you process the issuance and offers framing of the certificate. They will stop issuing certificates on October 16th, so you still have some time to get a piece of history to hang on your wall. It's said that original certificates that were hand signed by Walt Disney on Disney's initial public offering are selling upwards to $25,000! If you're interested in buying one before the deadline you can do so at sites like oneshare.com or giveashare.com. Or you can buy through your own broker (TD Ameritrade, Scottrade, etc) and see if they can issue you the certificate to you. 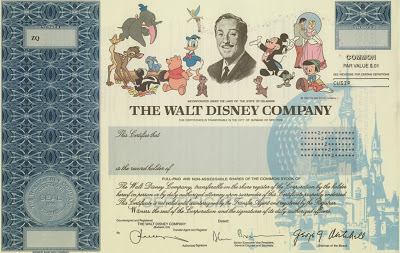 Some of the other popular companies to purchase share from and frame their certificate on the wall includes DreamWorks Animation and Build a Bear. Not all companies issue certificates anymore due to costs and logistic inefficiencies. Soon Disney will be gone too, issuing non-tenable certificates. Do you own any certificates? Do you plan to get a Disney certificate before they're gone?